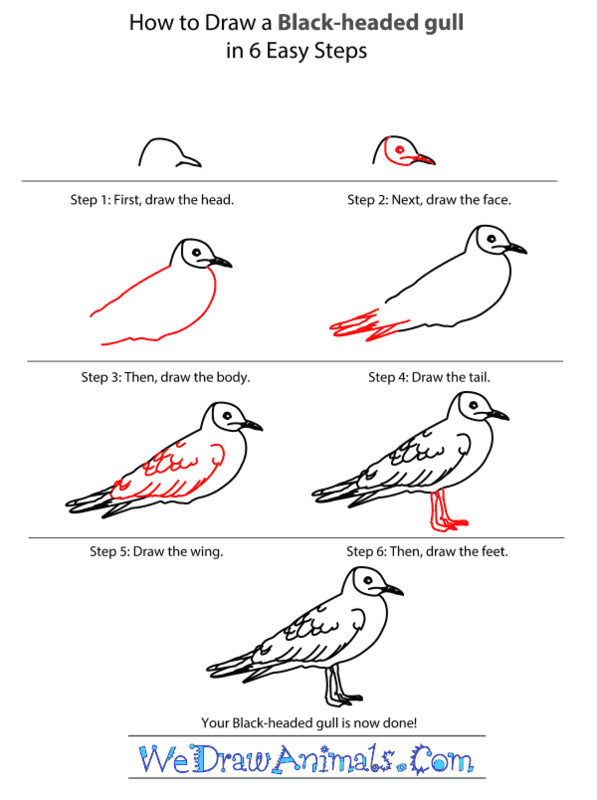 In this quick tutorial you'll learn how to draw a Black Headed Gull in 6 easy steps - great for kids and novice artists. At the bottom you can read some interesting facts about the Black Headed Gull. 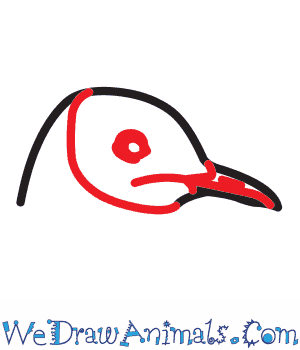 Step 1: To begin, draw a simple round head with a long, thin beak that comes to a point. Step 2: Now draw the face by making a semi-circle that connects to the bottom of the beak. Draw a small circle for the eye and a line for the opening of the beak. Step 3: Next, draw the body using curved lines. The lines should be imperfect to give the impression of ruffled feathers. 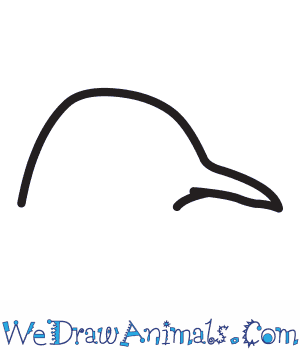 Exaggerate the curve of the line below the beak for the puffed chest of the bird. 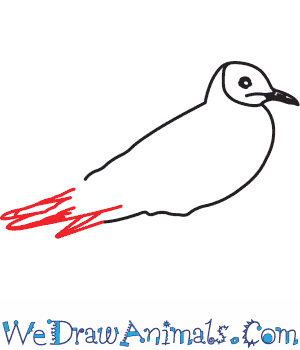 Step 4: Then, create the tail by adding three slightly rounded points to the back of the bird. Add lines to these three separate points to give the illusion of layers. Step 5: Draw the wing by making a line that nearly touches the bottom of the body and comes up into a dramatic curve for the "shoulder" part of the wing. Add lines to the bottom of the wing and U shapes of varying sizes along the side and back of your bird to make it's feathers. 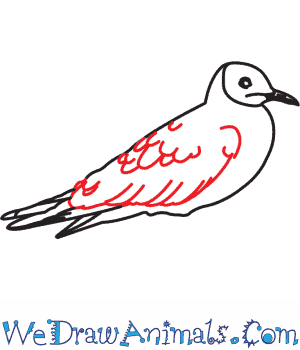 Step 6: Lastly, draw the two legs positioned beneath the middle of the birds body. Draw the feet using two diagonal lines. 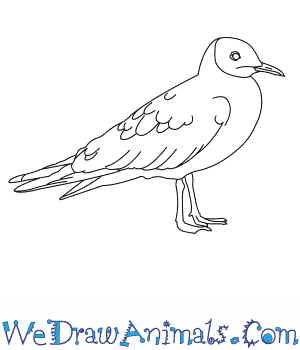 Your Black headed gull is now complete! The Black-headed gull is a small gull that grows from 35 to 39 centimeters in length, has a wingspan from 86 to 99 centimeters, and weighs from 205 to 340 grams. They can be found in Iceland, Finland or Denmark and sometimes migrate to Europe and Africa. Black-headed gulls are omnivores and eat mainly worms, fish, and various invertebrates. These birds are found in a varienty of habitats. They winter in farmlands, coastal marshes, or urban parks. They breed in marshes, ponds, sand-dunes, or lakes. Females usually lay one to three eggs each season. Black-headed gull eggs are incubated for 22 to 26 days. Young Black-headed gulls learn to fly within 24 to 35 days. The average lifespan in the wild is 218 months. The Black-headed gull population is estimated to be two million pairs. These gulls are in the Class Aves, the Order Charadriiformes, and the Family Laridae. 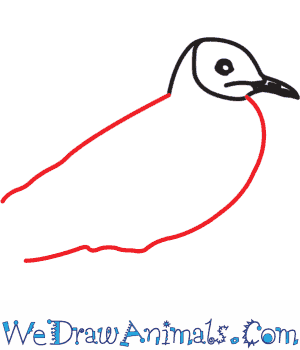 Lesson plan note: Draw and cut out pictures of the Black-headed gull. 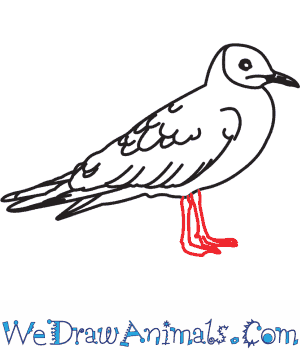 Distribute copies to the children and have them color their gulls. They can use markers, colored pencils, or crayons. Write the child’s name on the back of their gull. Then, tape a piece of long string to each colored bird. Finally, hang the Black-head gulls on the ceiling for all the children to see.